Homeowners who lost their homes to foreclosure could be eligible for a small award of up to $2,000 as part of the settlement deal. NEW YORK (CNNMoney) -- The nation's five largest banks have finally struck a deal with 49 states to settle charges of abusive and negligent foreclosure practices dating back to 2008. Under a deal announced Thursday, the banks will commit $26 billion to help underwater homeowners and compensate those who lost their homes due to improper foreclosure practices. 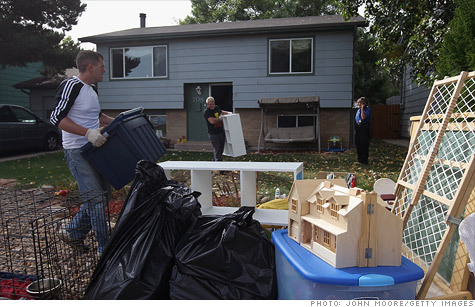 The banks also agreed to change the way they handle and approve foreclosures. A group of state attorneys general claimed that banks lost important paperwork, cut corners and enlisted robo-signers to attest to facts they had no knowledge of on hundreds of documents a day. The settlement has been in the works for more than a year. What did the mortgage lenders and loan servicers agree to do? The banks and servicers have committed at least $17 billion to reduce principal for borrowers who 1) owe far more than their homes are worth 2) are behind on payments. The amount of principal reduction will average about $20,000 per borrower. Another $3 billion will go toward refinancing mortgages for borrowers who are current on their payments. This will enable them to take advantage of the historic low interest rates currently available. The banks will pay $5 billion to the states and the federal government, the only hard money involved in the deal. Out of that fund will come payments of $1,500 to $2,000 to homeowners who lost their homes to foreclosure. Other funds will be paid to legal aid and homeowner advocacy organizations to help individuals facing foreclosure or experiencing servicer abuses. Another $1 billion will be paid directly by Bank of America to the Federal Housing Administration to settle charges that its subsidiary, Countrywide Financial, defrauded the housing agency. are taking part in the settlement. In addition, nine other unnamed loan servicers may join the settlement later, and that would bring its value to $30 billion. The Federal Housing Finance Agency, which oversees the two government-sponsored mortgage giants, will not allow any balance reductions for loans insured by the companies under the settlement. I lost my home to foreclosure; how do I know if I qualify for payment? If you were foreclosed on in the calendar years 2008 through 2011, you may be be eligible for a payment of up to $2,000. People who think they may qualify should notify their bank. The exact amount of the payments will depend on how many people participate in this part of the settlement. They will share equally in a pool of $1.5 billion. The U.S. Department of Housing and Urban Development expects about 750,000 former homeowners to take part. As part of this deal, state attorneys general gave up the right to sue the mortgage servicers for foreclosure abuses arising out of the robo-signing scandal. However, they reserve the right to sue if they uncover improper acts when the loans were originated or when they were securitized. When will homeowners get paid? HUD said the settlement will be put before a court for approval within two weeks. It is unknown how long it will then take for a court to rule. The relief for homeowners has to be completed within three years, but the state attorneys general and HUD want it to be front-loaded and completed within 12 months. Would I have to pay taxes on the principal reductions or the pay-outs? If the principal is reduced in 2012, it will not be subject to income tax. That's because the Mortgage Debt Relief Act of 2007 allows taxpayers to exclude income from the discharge of debt on their principal residence. The act is scheduled to expire at the end of this year, however. So if the act is not extended and the principal reduction occurs in 2013, borrowers may be on the hook to pay taxes on the settlement amount. It's not clear whether you would have to pay taxes on the $1,500 to $2,000 payout. The IRS declined to comment on the question. Which state didn't participate and what does it mean if you live in that state? Oklahoma was the only holdout of the 50 states. Instead, it announced its own settlement with the five banks Thursday. Under its settlement, the banks agreed to pay $18.6 million in damages, part of which would compensate homeowners who were victims of unlawful and unfair mortgage practices, according to the Oklahoma attorney general's office. Homeowners who believe they may have been wrongly foreclosed upon should visit the Oklahoma attorney general's website and fill out the paperwork for processing a claim. Will the settlement make it harder to get a mortgage? The new rules and regulations the banks have agreed to under the settlement should have little impact on future mortgage borrowing since most of practices are already in place, said Keith Gumbinger of HSH Associates, a mortgage information provider. Only $5 billion of the $26 billion settlement will be a direct cost to the banks. The remainder will be the cost of modifying mortgages. Many of those modifications may be in the best interests of the banks to make, however, since the alternative may be foreclosure, which can cost banks more than modifications. Were you foreclosed on? Do you think the banks owe you money? Send your story and contact information to RealStories@turner.com and you could be featured in an upcoming article on CNNMoney.